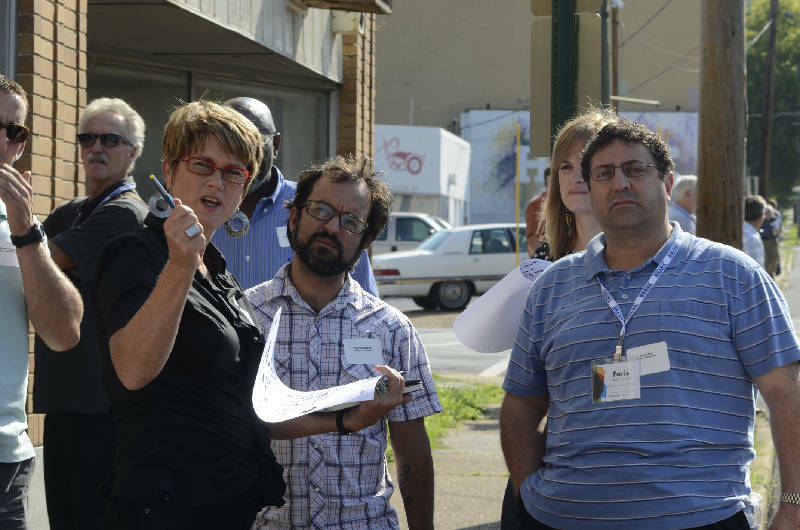 Design professionals Heidi Hefferlin, Tavis Salazar, Kelly Fitzgerald and Faris Eid, from left, take a walking tour during a meeting Wednesday to share suggestions for revitalizing the Glass Street commercial corridor. Architectural drawings of suggested improvements for Glass Street will be presented at the Chattanooga Trade and Convention Center today from 3:30-5:30 p.m. in Room 16. Chattanooga architect Blythe Bailey looks at dilapidated buildings and unkempt lots on Chattanooga's Glass Street and sees possibilities. An empty lot on the corner of North Chamberlain Avenue and Glass Street could become a community garden, a place to get residents active and talking to their neighbors while they grow produce, he says. And the vine-covered empty building behind it -- a former five-and-dime store -- could be a place for a sign that identifies the area as historic Glass Street. If the Glass House Collective has its say, the visions of Bailey and others will transform the formerly energized but now empty East Chattanooga community into a vibrant commercial corridor. And every merchant who comes to the neighborhood will capitalize on the traffic expected to travel on Glass Street. "This is a main strip that takes you from downtown to Volkswagen," said longtime resident Brittany Upshaw. "We want to bring it back to life." On Wednesday, architects -- noted for seeing life in buildings and structures that others see as lifeless -- business owners and East Chattanooga residents met in the small Glass House office at 2523 Glass St. to plan how the transformation will happen. Bailey joined with other architects, divided into eight groups, then listened and walked through the community while residents and business owners discussed changes they wanted to see. "All of these are abandoned closed buildings, but these are historic buildings," said Upshaw. "And the few stores that are out here don't get much attention because people don't know they exist." The architects came from across the state to Chattanooga this week to take part in the American Institute of Architects Conference. They chose the Glass Street area for their 2012 Legacy Project, in which the group offers a hands-on effort to improve a community. The event Wednesday brought artists and creative people together with the community to start reimagining what's possible on the street, said Glass House Collective Director Katherine Currin, one of three people who make up the collective that is spearheading the neighborhood revitalization. Local architect David Barlew said he is confident of the group's pending success. It only takes a few committed people to change the world, and there were 95 people working to change Glass Street on Wednesday, he noted. The group of residents and architects who met Wednesday designed ways to increase pedestrian traffic, create community gateways and slow down traffic on the street. Architectural drawings of suggested improvements for the street will be presented today at the Chattanooga Trade and Convention Center. Currin wants some suggestions implemented within a year. The Glass Street Collective landed a $300,000 ArtPlace America grant that will help, she said. "We've asked for lighter, quicker, cheaper ideas. Bite-size change the sooner, the better because we don't want to lose momentum," she said. Business owner William DeArmond Carter grew up about three blocks away from Glass Street and remembers the community in its former glory. The area thrived in the 1950s, '60s and '70s with a post office, ice cream shop, a Honda motorcycle shop, dry cleaner and grocery, he recalled. "It was very vibrant. It was a main thoroughfare to go to Booker T. Washington State Park," Carter said. Glass Farms Neighborhood Association president Etta Kanipes recalls a doctor's office, a dentist, a drug store with a lunch counter and fountain, clothing stores and a theater. "It was a town within itself," Kanipes said. "No need to go downtown. We had everything."